After more than 10 years not having any desktop at home, I recently started doing some deep learning work that requires more processing power than a quad-core laptop can provide. So I went looking for a powerful desktop machine, with the constraint that it had to be quiet. I do a lot of work with audio (e.g. Opus), so I can't have a lot of noise in my office. I could have gone with just a remote machine, but sometimes it's convenient to have some compute power locally. Overall, I'm quite pleased with the result, so I'm providing details here in case anyone else finds the need for a similar machine. It took quite a bit of effort to find a good combination of components. I don't pretend any component is the optimal choice, but they're all pretty good. First here's what the machine looks like right now. Now let's look at each component separately. Dual-socket Xeon E5-2640 v4 (10 cores/20 threads each) running at 2.4 GHz. One pleasant surprise I have found is that even under full load, the turbo is able to keep all cores running at 2.6 GHz. With just one core in use, the clock can go up to 3.4 GHz. The listed TDP is 90W, which isn't so bad. In practice, even when fully loaded with AVX2 computations, I haven't been able to reach 90W, so I guess it's a pretty conservative value. The main reason I went with Intel was dual-socket motherboard availability. Had I chosen to go single-socket, I would probably have picked up an AMD Threadripper 1950x instead. As to why I need so many CPU cores when deep learning is all about GPUs these days, what I can say is that some of the recurrent neural networks I'm training need several thousands of time steps and for now CPUs seem to be more efficient than GPUs on those. Choosing the right CPU coolers has been one of the main headaches I've had. It's very hard to rely on manufacturer specs and even reviews, because they tend to use different testing methodologies (can only compare tests coming from the same lab). Also, comparing water cooling to air cooling is hard because there's a case issue. 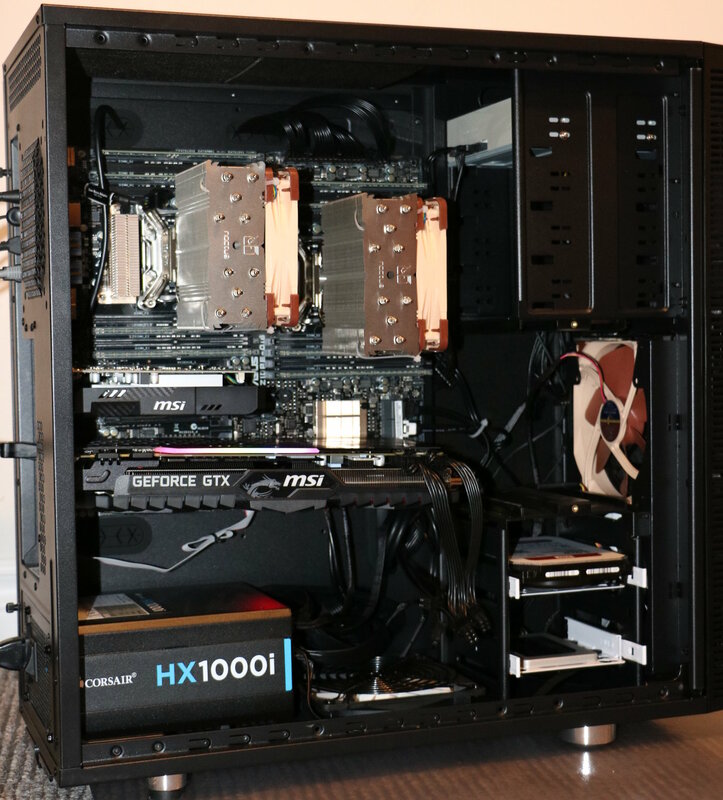 Air cooling is all well inside the case, so the noise level depends on the case damping. For water cooling, the fans are (obviously) setup in holes in the case, so they benefit less from noise damping. Add to that the fact that most tests report A-weighted dB values, which underestimates the kind of low-frequency noise that pumps tend to make. In the end, I went with a pair of Noctua NH-U12DX i4 air coolers. I preferred those over water coolers based on the reviews I saw, but also on the reasoning that the fan was about the same size as those on water radiators, but at least it was inside the case. Got an ASUS Z10PE-D16 WS motherboard. All I can say is that it works fine and I haven't had any issue with it. Not sure how it would compare to other boards. I have 128 GB ECC memory, split as 8x 16 GB so as to fill all 4 channels of each CPU. Nothing more to say here. For now, deep learning essentially requires CUDA, which means I had to get an NVIDIA card. The fastest GPU at a "reasonable" price point for now is the 1080 Ti, so that part wasn't hard to figure out. The hard part was finding a quiet 1080 Ti-based card. I originally went with the water-cooled EVGA GeForce GTX 1080 Ti SC2 HYBRID for which I saw good reviews and which was recommended by a colleague. I went with water cooling because I was worried about the smaller fans usually found on GPUs. Unfortunately, the card turned out to be too noisy for me. The pump makes an audible low-frequency noise even when idle and the 120 mm fan that comes with the radiator is a bit noisy (and runs even when idle). So that card may end up being a good choice for some people, but not for a really quiet desktop. I replaced it with an air-cooled MSI GeForce GTX 1080 Ti GAMING X TRIO. I chose it based on both good reviews and availability. I've been pleasantly surprised by how quiet it is. When idle or lightly loaded, the fans do not spin at all, which is good since I'm not using it all the time. So far the highest load I've been able to generate on it is around 150W out of the theoretical 280W max power. Even at that relatively high load, the fans are spinning at 28% of their max speed and, although audible, they're reasonably quiet. In fact, the air-cooled MSI is much quieter under load than the EVGA when idle. To avoid wasting resources on the main GPU, I went with a separate, much smaller GPU to handle the actual display. I wanted an AMD card because of the good open-source Linux driver support. I didn't put too much thought on that one, and I went with a MSI Radeon RX 560 AERO. It's probably not the most quiet card out there, but considering that I don't do any fancy graphics, it's very lightly loaded, so the fan spins pretty slowly. According to some reviews I looked at, the Corsair HX1000i appeared to be the most quiet PSU out there. All I can say is that so far, even under load, I haven't been able to even get the PSU fan to spin at all, so it looks like a good choice. The case was another big headache. It's really hard to get useful data since the amount of noise depends on what's in the case more than on the case itself. After all, cases don't cause noise, they attenuate it. In the end, I went with the Fractal Design Define XL R2, mostly due to the overall good reviews and the sound absorbing material in the panels. Again, I can't compare it to other cases, but it seems to be dampening the noise from the CPU coolers pretty effectively. The Define XL R2 case originally came with three Silent Series R2 3-pin fans. When running at 12V, those fans are actually pretty noisy. The case comes with a 5V/7V/12V switch, so I had the fans run on 5V instead, making them much quieter. The down-side is of course lower air flow, but it looked (kinda) sufficient. Still, I wanted to see if I could get both better air flow and lower noise by trying a Noctua NF-A14 fan. The good point is that it indeed has a better air flow/noise ratio. The not so good point is that it requires more than 7V to start, so I couldn't operate it at low voltage. The best I could do was to use it on 12V with the low-noise adapter, which is equivalent to running it around 9V. In that configuration, it has similar noise level than the Silent Series R2 running at 5V, but better air flow. That's still good, but I wish I could make it even more quiet. So for now I have one Noctua fan and two Silent Series R2, providing plenty of air flow without too much noise. Got a 1 TB SSD, which of course is completely silent. Not much more to say on that one. For the stuff that doesn't fit on an SSD, I decided to get an actual spinning hard disk. The main downside is that it is currently the noisiest component of the system by far. It's not so much the direct noise from the hard disk as the vibrations it propagates through the entire case. despite being mounted on rubber rings the vibrations are causing very audible low-frequency noise. For now I'm mitigating the issue by having the disk spin down when I'm not using it (and I'm not using it often), but it would be nice to not have to do that. I've been considering home-made suspensions, but I haven't tried it yet. I would prefer some off-the-shelf solution, but haven't found anything sufficiently interesting yet. The actual drive I have is a 8 TB, Helium-filled WD Red, but I doubt any other 5400 rpm drive would have been significantly better or worse. The only extra annoyance with the WD Red is that it automatically moves the heads every 5 seconds, which makes additional noise. Apparently they call it pre-emptive wear leveling. I've seen many contradicting theories about how to configure the case fans. Some say you need positive pressure (more intake than exhaust), some say negative pressure (more exhaust), some say you need to balance them. I don't pretend to solve the debate, but I can talk about what works in this machine. I decided against negative airflow because of dust issues (you don't want dust to enter through all openings in the case) and the initial configuration I got was one intake at the bottom of the case, one intake at the front, and one exhaust at the back. It worked fine, but then I noticed something strange. If I just removed the exhaust fan, my CPU would run 5 degrees cooler! That's right, 2 intake, no exhaust ran cooler. I don't fully understand why, but one thing I noticed was that the exhaust fan was causing the air flow at back to be cooler, while causing hot air to be expelled from the holes in the 5.25" bay. I have no idea why, but clearly, it's disrupting the air flow. 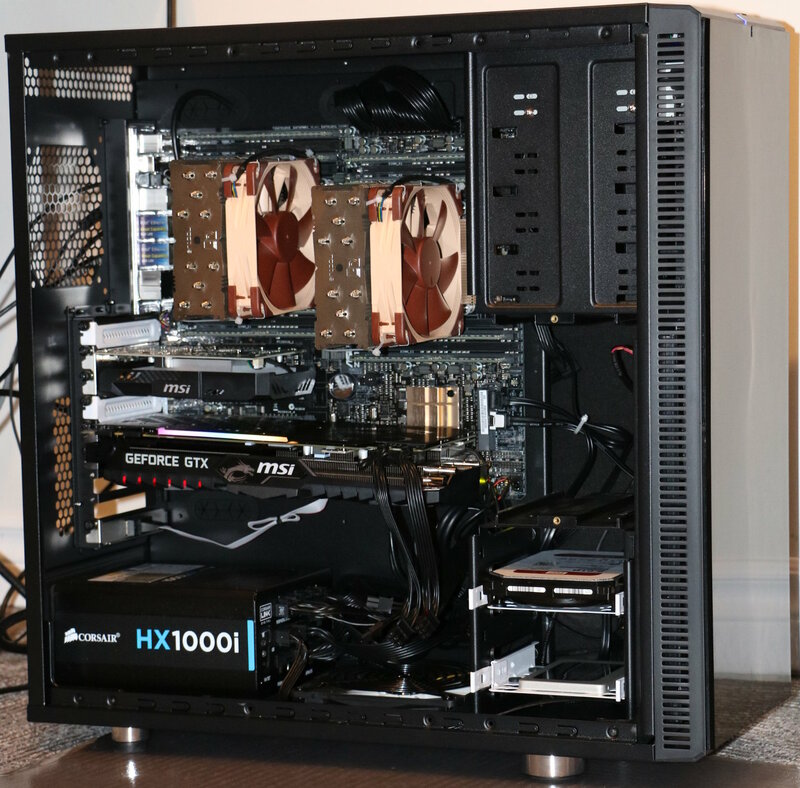 One thing worth pointing out is that even without the exhaust fan, the CPU fans are pushing air right towards the rear exhaust and the positive pressure in the case is probably helping them. When the CPUs are under load, there's definitely a lot of hot air coming out from the rear. One theory I have is that not having an exhaust fan means a higher positive pressure, causing many openings in the case to act as exhaust (no air would be expelled if the pressure was balanced). So in the end, I added a third fan as intake at the front, further increasing the positive pressure and reducing temperature under load by another ~1 degree. As of now, when fully loading the CPUs, I get a max temperature of 55 degrees for CPU 0 and 64 degrees for CPU 1. The difference may look strange, but it's likely due to the CPU 0 fan blowing its air on the CPU 1 fan.